Gerspach Sikoscow LLP has a track record of impressive trial results defending physicians, hospitals and other health care providers in complicated medical litigation. These results were achieved through knowledgeable and effective legal representation. However, equally as important, we have been able to maintain long-term relationships with our clients because we provide personalized attention to every client. These tenets are what our firm was founded upon and what we believe will ensure its continued success. 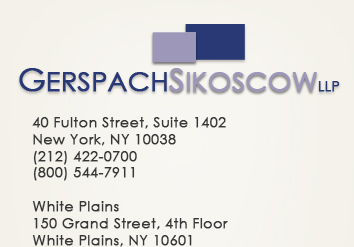 Gerspach Sikoscow LLP is a paperless law firm with a "virtual office" that enables us to confidentially provide our clients with access to documents concerning their case via the internet using a secure user name and password unique to each client.